Confession: The Sound of Music is a sentimental favorite of mine for many reasons, and I cannot possibly be impartial when watching any version of it. I just love it, plain and simple. Firstly, when I was growing up in the olden days before the internet, cable, or even VCRs, we were at the mercy of TV programming what movies we watched over and over. Fortunately The Sound of Music was one that was played every year, so I grew up loving it as a child loves it. Then I had the pleasure of playing in the pit orchestra for my high school production (the most fun this nerd ever had in high school), which gave me a whole new level of appreciation for Rodgers and Hammerstein's beautiful score. Finally, I had the great opportunity to study abroad in Salzburg, so that now watching the movie is like a nostalgic trip to my European home-away-from-home. 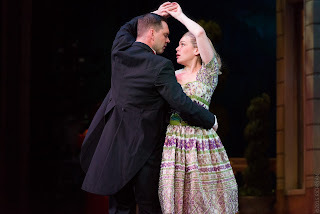 So you see, The Sound of Music is beloved to me, and the Ordway bringing it to life on stage with a mostly local cast chock full of favorites is a dream come true. While there is nothing really new or revolutionary about this very faithful production (directed by Gary Briggle and choreographed by Bob Richard) of a well-known classic, or maybe because of that very fact, the show cast a spell over me from which I didn't want to ever awake! The Sound of Music is one of America's most beloved musicals, not just mine, so there's no need to rehash the story here. Let's just get right to this dream of a production. The Ordway is all decked out in holiday splendor, including the beautifully lit Rice Park just outside its doors (I'd call it a winter wonderland, of only there were snow). 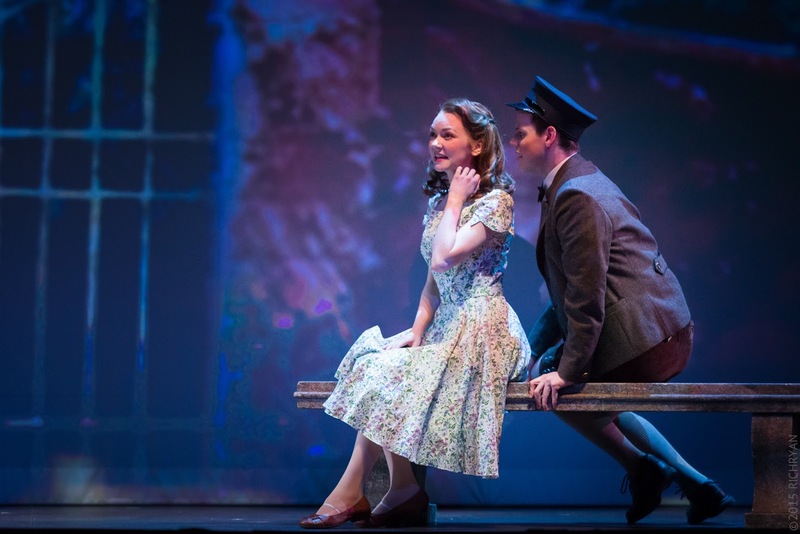 On the Ordway's huge main stage the story of the spirited would-be nun, reluctantly singing children, stoic captain, and their escape from the Nazis plays out in all it's familiarity. Although not quite exactly; the movie adaptation moved around and cut some of the songs from the original stage version, and added new ones. But it's close, and the beloved score sounds so gorgeous as played by the 20+ piece pit orchestra led by Raymond Berg that I just wanted them to keep playing and playing after the curtain call (if only I hadn't given up the clarinet and could take my place among them!). The Ordway has assembled an all-start cast, beginning with Billie Wildrick, who returns to the Ordway after starring in A The Christmas Story last year. And while I can't help thinking there are a half dozen local actresses who would be amazing in this role (look no further than the ensemble), Billie is a wonderfully warm and strong Maria, with a beautiful voice and a natural charisma with the children and the Captain. Speaking of the Captain, no one could be as dreamy as Christopher Plummer in the movie (or just generally in life, even at 86 today! ), but Dieter Bierbrauer comes close. If I had cast this show myself, I would have chosen Dieter for the role, not just for the appropriately German name, but also for that voice that I never tire of listening to, and the way he believably transforms from the stern, cold, broken man into the warm and loving father and husband, all the while a proud Austrian firm in his beliefs. These kids are pretty dreamy too. 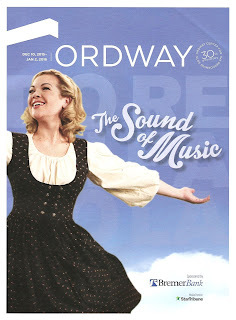 Beginning with an open casting call at the Mall of America this summer, the Ordway has found what feels like a family of ten children (the usual seven plus a few alternates/understudies), some of whom are regulars on Twin Cities stages, and some of whom are making their stage debuts. Every last one of them is talented, adorable, and wholy present in what must be the best game of make-believe. The effervescent Caroline Innerbichler may be a bit older than "Sixteen Going on Seventeen," but she can pass for it, and is a delight as Liesl (keep your eye on her during "Do-Re-Mi" and you'll see the stubborn teenager soften into a playful child). Matthew Rubbelke is charming as her telegram delivering beau Rolf (don't you just hate it when the boy you're crushing on turns out to be a Nazi?). Kersten Rodau as the Captain's Baroness girlfriend and James Detmar as his opportunistic friend Max provide a bit of humor and edge to the show. But as much as I love the actors and the characters, I had a hard time making myself care about their songs that were cut from the movie, and just wanted to move on to the familiar favorites. This ensemble is the reason the phrase "embarrassment of riches" was invented. It truly is almost embarassing to have this much amazing local music-theater talent in the supporting cast with not enough time or material to showcase them all. Just to name a few, we have Wendy Lehr as the housekeeper (Wendy Lehr! ), Tod Peterson as the butler, Peter Moore as the evil Nazi, and Reid Harmsen (who is also credited with casting this brilliant troupe) as various characters including, if I'm not mistaken, a brief appearance as a nun! Besides Reid this beautiful chorus of nuns includes the likes of Kate Beahen, Debra Berger, Elizabeth Hawkinson, Suzie Juul, and Janet Hayes Trow, each a star in her own right that never gets to fully shine in this production except in glorious harmony with each other. Speaking of gloriously singing nuns, I would pay good money to watch a sing-off between these nuns and the nuns singing and dancing up a storm on the Chanhassen stage. It's enough to make one want to join a convent (my dad would be so happy). For those of you who, like me, could recite every line of dialogue and sing along to every song, please hold it until the family Von Trapp sings "Edelweiss" at the festival and the Captain gestures to the audience to sing along. The spell of this show is never more potent than when singing "edelweiss, edelweiss, bless my homeland forever!" with the audience and this wonderful cast, making me feel like part of the experience. One small nitpick - I would have liked the costumes to be more authentically Austrian and less, well, costumey (because I lived in Austria for four months in the mid-'90s, I'm obviously an expert in 1930s Austrian attire). There are some lovely Austrian touches in the distinctive jacket collars and hats, but I wanted more of it, more of the muted greens and greys and less of the browns and bright colors. (A purple vest? A plaid tie? Brown velvet lederhosen? No.) The painted backdrop of mountains and evergreens did, however, feel like home, and the set quickly and efficiently transforms from mountaintop to somber abbey interior to the courtyard of the Von Trapp home (costume design by Lynda L. Salsbury, scenic design by Kenneth Foy). Even in the warm and familiar context of this musical, watching the Nazi flag unfurl is disturbing, as it should be. Hearing Max say "what's going to happen is going to happen, just make sure it doesn't happen to you" is frightening, because this is exactly the attitude that allowed Hitler to come to power in 1930s Germany. And it's eerily familiar in today's world where certain political candidates are preaching fear, exclusion, and divisiveness. While The Sound of Music doesn't convey the impending horror that was 1930s Germany as well as, say, Cabaret, it's enough to give one pause. But that's enough of the serious stuff, this a MUsical! A musical in which a distant father becomes a warm and loving dad in the space of a song, a couple falls in love during a dance, engagements are made or broken in an instant, the bad guys are clearly identified by the "black spider" on their arms, and climbing a mountain outside of Salzburg lands you in Switzerland rather than Germany (who cares about geography in a musical?). And that's why we love it, for the optimistic feel-good triumph of good over evil, love over fear, and music over everything. If only life were that simple. 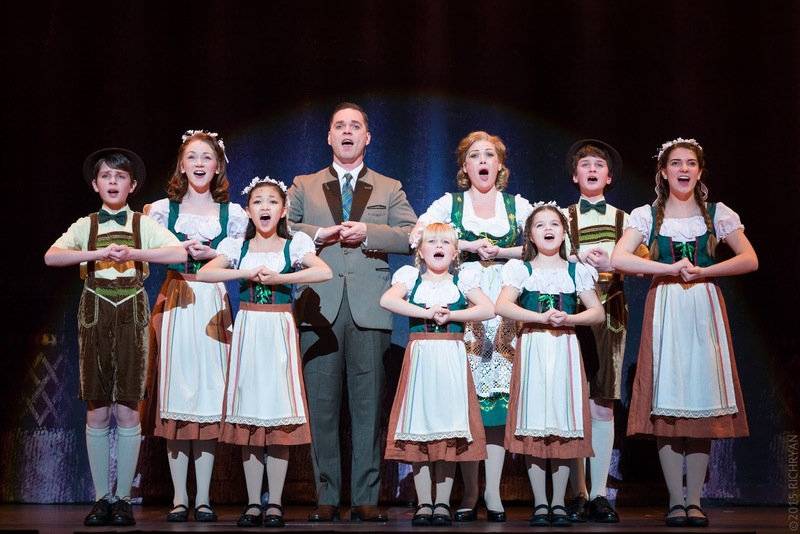 The Sound of Music continues at the Ordway Center for Performing Arts through January 2.